Source: CICH graphic created using data adapted from Statistics Canada, Aboriginal Children’s Survey, 2006 Aboriginal Children`s Survey. http://www.statcan.gc.ca/pub/89-634-x/89-634-x2008001-eng.pdf -accessed July 17, 2017. 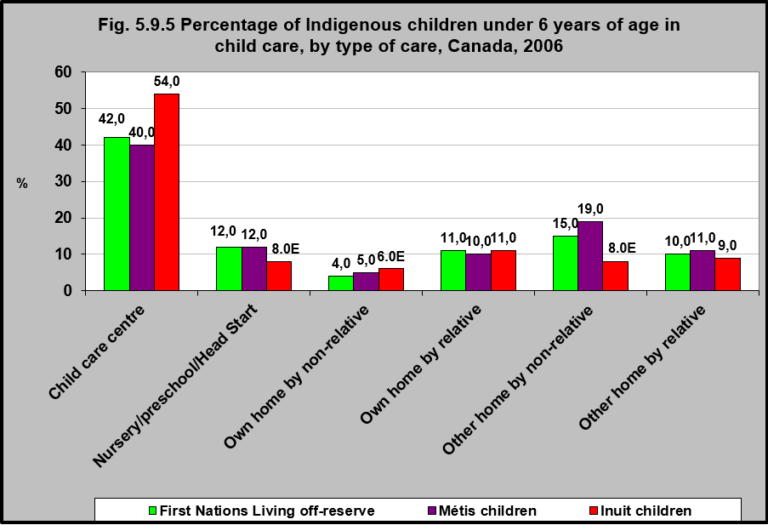 In 2006, the majority (40 – 54%) of First Nations children living off reserve, Inuit children and Métis children under 6 years of age, who needed child care, went to child care centres. All other types of child care were used less than 19% of the time by Indigenous children and their families. Own home by non-relative was the least used form of child care. By providing child care that focuses on children’s language, social, motor and academic skills in ways that incorporate culture and Indigenous languages, programs can have positive impacts on school readiness and on the health promoting behaviours of Indigenous children, as well as on enhancing parental skills that contribute to healthy child development.1 There is a need to ensure all Indigenous children have access to culturally relevant early child development programs. 1Ball, J. (2014). Improving the reach of early childhood education for First Nations, Inuit and Mètis children. Child care: Moving Children Forward, December. Retrieved October 11, 2017 from http://www.ecdip.org/docs/pdf/Improving%20Reach%20of%20ECE%20to%20First%20Nations,%20Inuit,%20Metis%20Children.pdf; Public Health Agency of Canada. (2012). The impact of the Aboriginal Head Start in Urban and Northern Communities (AHSUNC) program on school readiness. Ottawa, ON.